You know the cooking experience is going to go well when you are offered a beautiful orchid plant even before starting the lesson! The story may be apocryphal but I had read that in China it was customary for an audience to clap before the show took place, maybe to clear the air of any unwanted negative energy or, on the contrary, to imbue the air with positive vibrations emanating from the clapping itself. I was just so touched by the attitude of gratitude that my two fellow kitchen ‘combatants’ showed me with their floral offering and their smiles. The venue was the home of Victoria Bonadonna and her very generous and thoroughly organized kitchen space. I don’t like the kitchen spaces used for formal cookery lessons; highly technical, ergonomic and hygienic in the extreme, and thus practical for understandably obvious reasons, they lack any ‘real home’ element to them – it’s like being in a gymn as opposed to walking in a park or swimming in the sea. Victoria’s is no huge kitchen and is proof that size does not matter immeasurably when it comes to putting good food on the table. Victoria does, however, boast many and necessary accoutrements for making the cooking process a smooth one, the helpful kitchen gadgets or ‘toys’ as I call them: precision electronic scales, knives, immersion blender, electric whisk/beater and plenty of pots and pans of all sizes. Victoria has plenty more kitchen trinkets but these are the ones that really matter. Oh, and scissors ! Scissors can save the day. And Victoria is, and very much so, organised. I think that that is one of the ‘ingredients’ that doesn’t get enuogh mention when it comes to realistic, do-able, enjoyable cooking. Mental clarity and organization are everything. So it is better to start learning a few simple techniques and tips first and play around with those until they are under your belt, and then brave recipes that require a lot more skill. And this is precisely why I love Italian cookery: the techniques are so easy, anyone can learn them. Good meals can be prepared in very little time. Since time management, as we know, is something of a challenge for so many of us, this is an immense boon. Victoria is the mother of two and an accomplished home cook. Moreover, she can bake whereas I do so with hesitant trepidation. And she can barbecue too – which I cannot because we live in an apartment and don’t have a garden. Victoria is privy to an award-winning barbecue recipe that her cousin in Missouri shared with her; she gave me some tips for spare ribs that I then made for my nephew who loves them and, though roasted in an oven as opposed to a proper barbecue, boy! Boy were they good!. Victoria’s lifestyle is typical of many women raising kids: an early wake-up, breakfast for the kids, drive them to two different schools, pick them up at lunch time (in Italy school kids finish their day at around 1 o’clock after a certain age), make them lunch, make sure they get started on their homework, take them to various sports or activities in the afternoon, and then – of course- make them dinner. In other words, she is busy. Busy all day. In and out of the car at regular daily intervals. Oh and did I mention that she runs the Culture Club of the Castelli as well as the Castelli Welcome Neighbour Association? Christine (below) is a mother to be and about to return to her native Napa after spending nearly two years in Italy on account of her husband’s work. She likes to cook too and was keen to learn more about a few simple, easy to make Italian recipes, for weekday meals. So Victoria and I conspired to organize an Italian Bootcamp Cooking Basics for her day before yesterday. The appointed time was 10 a.m. and it had to be over by 4 p.m. I did most of the shopping the day before but bought some fresh vegetables first thing in that morning. Here we are, the car unloaded and we are about to begin. Below is the list of what we prepared together. At the end of this post, I put up some links to most of the recipes we cooked that I have blogged about. (1) Chicken stock – which we used to make (2 ) Chicken Corn soup (admittedly not an Italian recipe) and (3) Egg Drop Soup (stracciatella). We also made (4) Salad soup. (5) We prepared the easiest of tomato sauces – Marcella Hazan’s tomato sauce using just a can of plum tomatoes, an onion and plenty of butter. We used this sauce to make (6) riso al pomodoro (rice in tomato sauce) and to cook (7) meatballs in what was left of it. It would make a delicious sauce for pasta too (8), all one would need is add some freshly grated parmesan. So just think about this: one tomato sauce and three recipes as a result! We prepared previously cooked, shop bought (9) borlotti beans with the rind of pancetta and some tomato paste squeezed out of a tube (we had used the pancetta for the salad soup). We made (10) pasta e ceci (pasta and chickpea/garbanzo thick soup). Using my special quick-and-easy technique, one could also make pasta e fagioli, pasta with beans soup, it would be the same procedure. 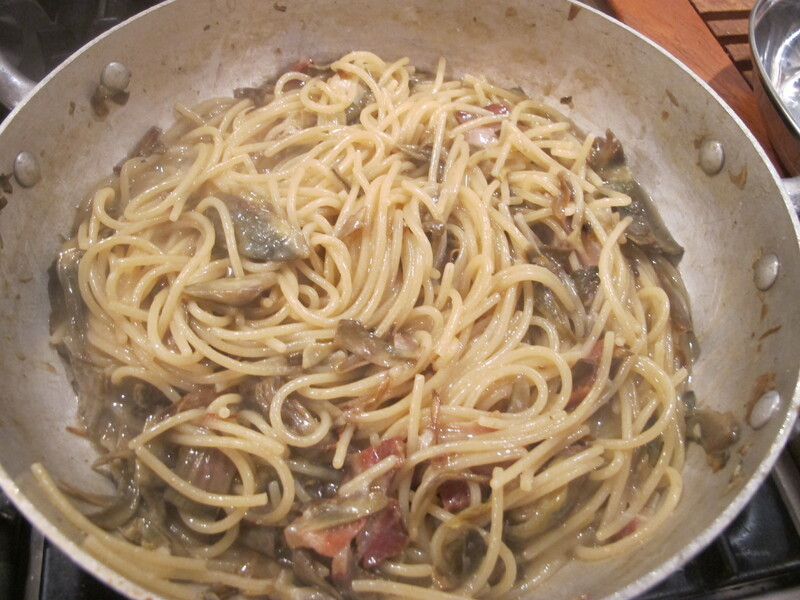 Pasta dishes: (11) pasta with broccoli and sausage and (12) spaghetti with garlic, oil and chilli flakes. The broccoli and sausage pasta (11) is on the upper left of this photo, next to the carrots. We made (13) polpette – meatballs – from scratch and cooked them in the tomato sauce with the addition of peas. We used thinly sliced chicken breasts to make (14) chicken with ginger (my own recipe) and (15) chicken with oranges. We blanched spinach to make (16) spinaci alla romana. We cooked (17) broccoletti in the oven with olive oil, lemon zest and a dusting of parmiggiano (parmesan). We made (18) mashed potatoes the Italian way (with the addition of parmesan and nutmeg). We also made (19) a pepper stew – peperonata – even though this is not the best seasons for capsicum. We also sliced some carrots (20) and cooked them down with butter and water. We made a very unscientific batter (21) and fried (22) artichokes and (23) courgette/zucchini flowers. And this marked the end of the savoury dishes. Last we made a (24) jam tart (crostata) with wild cherry jam. When I say ‘we’, I actually made Victoria make it – I know she likes getting her fingers stuck in the job when it comes to baking. Thank goodness for a stand mixer … I was giving her instructions all backwards, and told her to put the flour in first, instead of the butter. Ah well, kitchen catastrophes do take place and we have to understand that that is ‘normal’ too, and that we have to find remedies for them. A good sense of humour and a glass of wine can be very helpful. The sour cherry crostata, just out of the oven. Victoria, on the left, is holding the crema pasticcera (baker’s custard). Well … thank you Christine and Victoria. We certainly did a lot of both ‘doing’ and ‘being’. If you are interested in trying some of the recipes above, for which I have written a blog post, you will find the links below. Recipe for crostata pastry (pie crust): 300g sifted flour, pinch of salt, 3 egg yolks, 1 whole egg, 150g sugar, 150g butter at room temperature, finely grated lemon zest. And the flowers are just so beautiful. Again, thank you. In which a disgruntled hero tackles a disappointing result hands on hips. Well, the hero (or heroine rather) would be me, and the adventure a culinary one from which even Aesops might draw a moral. It all began with my being attracted to a recipe for cooking artichokes in a way completely different from my usual Roman trope (alla romana, alla giudia or even fried in batter). Indeed, the recipe hails from Lombardy and the hint of mint made my nostrils flare with anticipation: parmesan, breadcrumbs and mint – what’s not to like? To be baked in the oven as opposed to the stove top – curioser and curioser. So, nothing loath, off I trotted to buy the carciofi, the artichokes. The original recipe called for six artichokes but because there were going to be only two of us for dinner I halved the amounts. Thus: 3 artichokes, 40g grated parmesan, 25g breadcrumbs, fresh mint leaves, 2 tablespoons olive oil. Usually I comment the photos I take, one by one. This time I won’t reference throughout because the procedure is quite obvious. The artichokes need to be trimmed and their tough outer layers of leaves be unsparingly removed (show no mercy). Simmer the artichokes whole in boiling salted water for 15 minutes, drain and place in cold water until they cool down. Put the stuffing together (breadcrumbs, grated parmesan, minced mint leaves, and olive oil). Stuff the artichokes, sprinkle salt, dribble olive oil and place head down in a pyrex dish, with each head of artichoke covering a whole mint leaf. Put the dish in a preheated oven (150°) for around 40 minutes. Remove from the oven … and this is when I am supposed to say, “And Enjoy”. They were … haaard. Woody. Woody and weird. Unappealing in the extreme. I tried two bites and then gave in myself too. And I was angry. I hate it when a recipe fails to satisfy. In this I am very much like Richmal Crompton’s character William Brown, from her Just William book series. I expect readers much younger than I will have never heard of them and you don’t know what you you are missing – I think people suffering from depression should be made to read them as part of their recovery programme (here is a link to an episode from the TV series: https://www.youtube.com/watch?v=TycXDEZdqgo – and here is another one, from a previous series:https://www.youtube.com/watch?v=vEVm4MuB9_c ) but the original books are bound to be better). Anyway, in one of the stories, I’m afraid I can’t remember the title, William is spurred to break apart a grandfather clock, following the instructions from a Do-it-yourself book on how to recreate something or other. When he attempts to put the clock back together again, and is unable to, he blames the book. “You’d think the book would know what it’s talking about!” he complains bitterly, feeling quite betrayed, and amazed that his parents should get cross with him for his misdemeanour. And that’s a little how I felt about that artichoke recipe. And so, just before falling asleep that night, I vowed that I’d teach those artichokes a lesson or two, huh. Scroll down and you will find out how I salvaged the situation. This is what I started off with. Basically, two cooked artichokes. I placed them in the processor and turned them to a pulp. I cut up a mozzeralla into small chunks. And I rolled the pulp into ball shapes. I flattened the balls and placed some mozzarella over each one. I rolled them back into a ball again. So, in other words, each ball was stuffed with some mozzarella. I I beat one egg and coated the artichoke balls with it. I then coated the balls with breadcrumbs. And I fried them in batches in very hot oil for a very short time (they were already cooked after all) – just until they turned golden. Here is one of them, cut in half … the molten mozzarella looking like the telephine line of a supplì ! And this time, they WERE good, phew. Not sure I’d make them again but at least I managed to salvage the situation and make something good of a kitchen catastrophe. Three left over the next morning. Good even at room temperature. So: three cheers and hurrah for luscious leftovers and delicious fried artichoke patties. The fried food fanatic (FFF) did it again, yeay! PS St Lawrence is the patron saint of cooks. Does anyone know if there is a patron saint for fried foods? We had some friends over for supper last week and I thought I would do the clever thing without cutting corners, and that is to go for slow-cooked dishes that wouldn’t require me to hover and fuss over them too much, especially not once the guests arrived. So I opted for a menu to include tried-and-tested, crowd-pleasing dishes: egg noodles with duck sauce , followed by a Peposo, an ancient recipe from Impruneta in Tuscany that is the most minimalist recipe ever for beef stewed in wine, and, as a vegetable side dish (‘contorno’), artichokes braised the Roman way, carciofi alla romana. Friends coming over to dinner brought loaves of heady-frangranced home made bread, pumpkin and orange soup and potato dauphinois. Another brought a ricotta cake and my sister-in-law Nadia made the pudding: panettone pudding with a spiced cream redolent of mulled wine. Here is the beef, drowned in red wine, about to be cooked nestling inside an earthenware saucepan . (https://myhomefoodthatsamore.wordpress.com/2014/02/13/going-tuscan-for-st-valentines-peposo-cannellini-and-spinach/) These cooking vessels are brilliant for slow cooked dishes requiring a low heat. Here is the red wine I used – a very nice selection from Lazio’s Cesanese varietals. And here are the artichokes I braised : all twelve of them! I very wisely started cooking them last so that the prepping would coincide with an encouraging glass of fermented grape juice around wine o’clock (do admit, 12 artichokes are a LOT of artichokes to deal with). 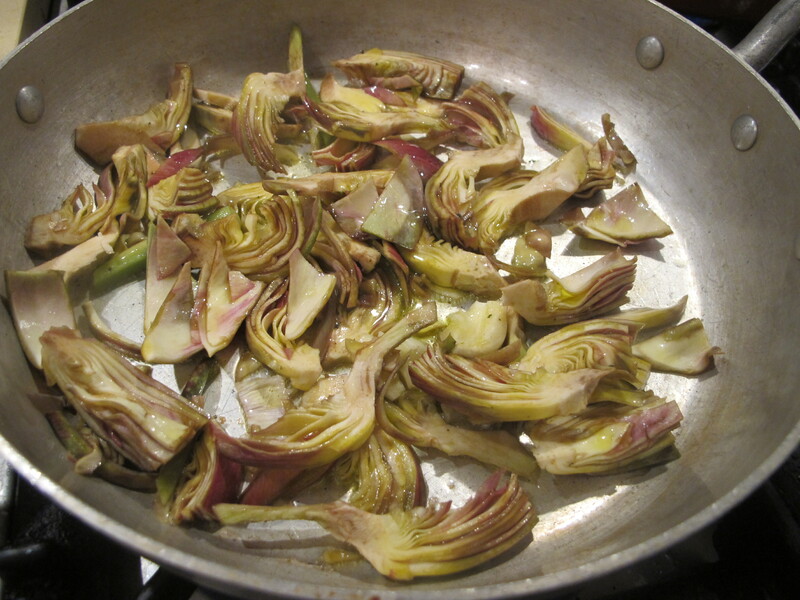 (https://myhomefoodthatsamore.wordpress.com/2011/03/05/edible-roses-the-seasonally-correct-artichoke-2/). And the dinner went very well, I am glad to say. We all enjoyed ourselves, it was a lot of fun. As for the nex morning, however, what do we get? Lots of washing up to do! That’s what. That is the bottom of the pan in which the duck ragu cooked. Ouff. Had to leave some water and salt soaking in it for half a day before I was ready to scrub that off. Here is the terracotta saucepan in which the peposo cooked. This is every so easy to wash but one does have to careful because a careless slip of the hand and … crash … no more saucepan. Plus, it really is very large and quite difficult to handle. And this was the big huge pan for the artichokes. None of these pans, it goes without saying, fit into a dish washer. So yes … a bit of a pallaver, all told. Not to mention the wine glasses. And last but not least, the tablecloth needs to be washed and ironed. For all that I am a sane person and much happier cooking than cleaning and washing up, I have to say I rarely mind the ‘day after’. I do what has to be done in batches, if I can, and I go over all the nice elements of the night before, reliving the most relishable moments. The lovely home made bread. Lovely home made butter too! And friends and family tucking into the meal. Conversation. Laughter. Teasing. Glasses clinking. Head nodding of approval. Head shaking when in disagreement but nobody cares anyway. Pouring of wine (and water too … ). It’s all about being together. There were ten of us. And then it’s time for pudding …. dessert. Nadia to the rescue. But we have to clear the table first. Let me tell you all about that in the next post. When an old friend announced that she and her husband and a couple of their friends were going to be spending a few days in Rome over the New Year, an impromptu decision made at the last minute, I of course revelled at the prospect. We met, rather bleary eyed and worse for festivity wear, on the evening of January first for an aperitivo at Rosati’s in Piazza del Popolo. As we sipped our respective cocktail favourites (prosecco, Negroni and Spritz) we exchanged stories of the night before and the fun and bopping and fireworks that we had appreciated. 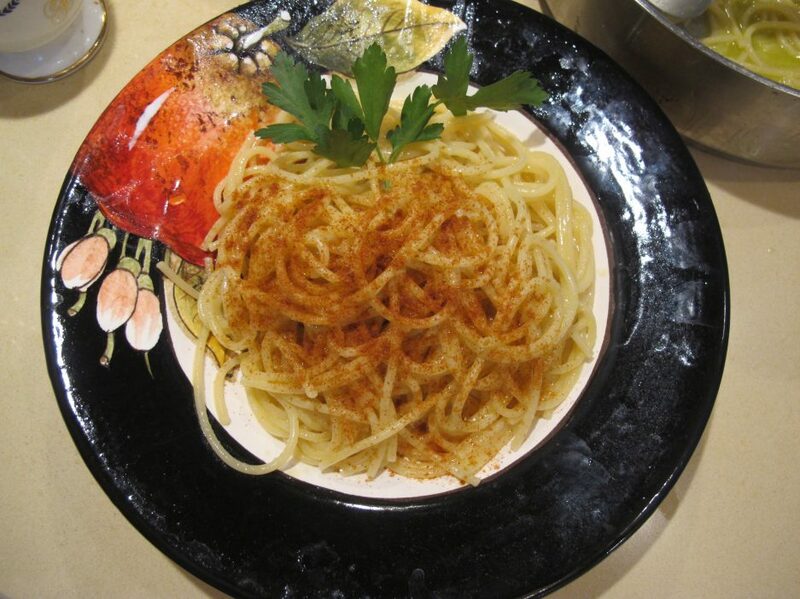 The place they had chosen was in the heart of Rome’s “centro storico” had provided much appreciable people-watching and an allegro atmosphere but the food, unfortunately, was nothing to speak of. “All the courses were the same colour is about all I can say!” was her description of its gastronomic underwhelm. That got me thinking. There is an Italian expression that says “anche l’occhio vuole la sua parte”, meaning “the eye too wants it share”, i.e. that appearances definitely matter. And we do indeed usually equate a platter’s bright and contrasting colours with freshness and come-hither appetitsing value. Conversely, a neutral beige or greige colour can only mutter lack of oomph when it comes to food. And yet, what is one to make of porridge? If you like porridge, you don’t complain about its colour now, do you? And what of dark browns? When a good friend treats you to some very snappy red wine by way of a huge bottle of Trinoro ‘Le Cupole’, in the course of an end-year potluck party, you have good cause for celebration; when said friend insists you take home the bottle with one third of the wine left in … well then, its boozy bonanza I’d say. I had some left-over stewed artichokes and three sausages. Trinoro to the rescue! I cooked the sausages with some of this red nectar and then added them to the artichokes. I think those green stringy ‘bits’ are parsely stems. And here on the plate is the regal sausage with artichokes and a spoon of horseradish for an extra bit of vim. What could be better than sausages cooked in red wine served with Le Cupole? The wine tasted lovely even 48 hours later,by the way. All that remained the following day was one measely martini-glass amount of the wine. I had read about a recipe cooking cauliflower with olive oil, red wine, onion, black olives, anchovies, and pecorino romano cheese. I thought I’d give it a try. Here are the ingredients, all of them except for the pecorino romano. Start chopping up the onion and laying it as one single layer in the saucepan; then cut up the cauliflower into florets; douse with plenty of olive oil. Add the fillets of anchovy, the black olives and a shower of freshly grated pecorino cheese. Take one last tiny sip of the red wine … and make a love filled libation to the person you fancy the most or in gratitude to your destiny. Spread out the cauliflower florets so as to make a hole in the middle of the pan and pour the red wine right in. Sprinkle a little bit of salt and white pepper. Cover with a lid and cook over a modest heat for about 20-30 minutes. And here it is served on a nice platter. The platter is very lovely indeed, the creation of a friend of mine, artist Cassandra Wainhouse who had made San Gimignano her home for many years. Now … I ask you. Does this dish look tempting? Does it make you think, Golly I can’t wait to try it! No. And that’s because the red wine has turned the white of the cauliflower into a slush colour. Again, do these sausages and the artichokes look particularly enticing? Let’s face it they don’t. All this to say that colour, i.e. the colour of the foods we are about to eat, is not always the best indication of how tasty or appealing a dish is going to be. Those sausages were fab and the cauliflower was very interesting and I am going to make it again this way (perhaps not cook it quite as much). May this new year be colourful in the best of ways for us all! Happy New Year everyone. The venerable vegetable stew known as Vignarola. I have written about it before, yes I have. I was prompted to do so again (vignarola mania?) because in today’s recipe I went to the added trouble of removing the outer sheath of the broad beans, an excercise in ‘poshifying’ the dish as it were, hence the title. Simple ingredients, very grand finale. I don’t know how many of you will go to the trouble of actually making a vignorala. It is not at all difficult but it does take time. I have tried to present the recipe to make it as time-friendly as possible. Two artichokes, preferably the Roman kind that are at their prime in this season (Spring). What you see on this plate are two trimmed and sliced artichokes. These are fresh peas. Here are the fresh broadbeans / fava beans. Here are the spring onions and the lettuce. On the far north of this photo is the guanciale, the pork jowl. In the middle of the photo is a ceramic decorative object known as a ‘pumo’. It comes from Puglia and it is symbolic of good luck and the augury of all good things to come. I stuck it in the middle of the plates because I associate the colour green with Spring and with the making of the green vignarola vegetables: artichokes, peas and broadbeans. It is traditional to also add mint to the vignarola stew … here is some ordinary mint from a plant on my balcony. Here is the guanciale thickly sliced into a matchstick shape. Simmer the broadbeans for about 2 minutes, then drain and place in a bowl of iced or at least very cold water to cool them down. Then arm yourself with a good deal of patience … or better still, find someone else to step in and help you … and get on with the job of removing the skin of the broadbeans. One by one … Oh yes … it takes ages. Trim the artichokes. This means removing the outer petals of the globe; and then quarter each artichoke, and quarter again : i.e. cut into 8 pieces. Once cut, the artichokes must immediately be placed in a bowl of water to avoid the oxygen in the air turning them black. Every single recipe I have come across calls for lemon juice to be added to the water, and lemony water is what I always used too. But I found out only recently that it actually isn’t necessary at all – the water is quite sufficient. And now that we have everything in place … we can get cracking. 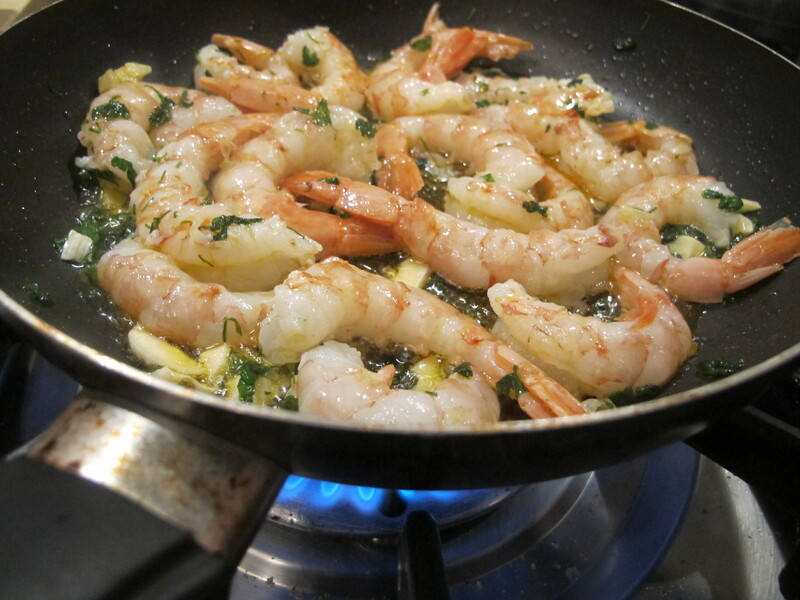 Dribble a generous amount of olive oil into a frying pan. I have a penchant for pepper corns and tinker them into nearly all my recipes. Here, I put six pepper corns into the pan. You may wish to avoid them altogether – you decide. Turn on the heat, and put the peas in the pan. Add one teaspoon of sugar. Add one teaspoon of salt over the sugar. Pour boiling water into the pan. Plenty of it … enough to cover the peas by 2 cm (an inch or so). Simmer until the peas are tender. It took the better part of 20 minutes to cook these. Peas done. Turn off heat, set aside. Step 2: Cooking the Guanciale Use another frying pan to render the fat of the guanciale over a medium heat. This takes about 2-3 minutes. Once the guanciale has crispened up a bit, add some olive oil. Now add the spring onions. Cook for only a couple of minutes. Now add the artichokes. Cook for about 2-3 minutes … Remember the peas? See how much cooking water there was? a kind of pea soup? Pour some of the pea soup using a sieve into the frying pan. 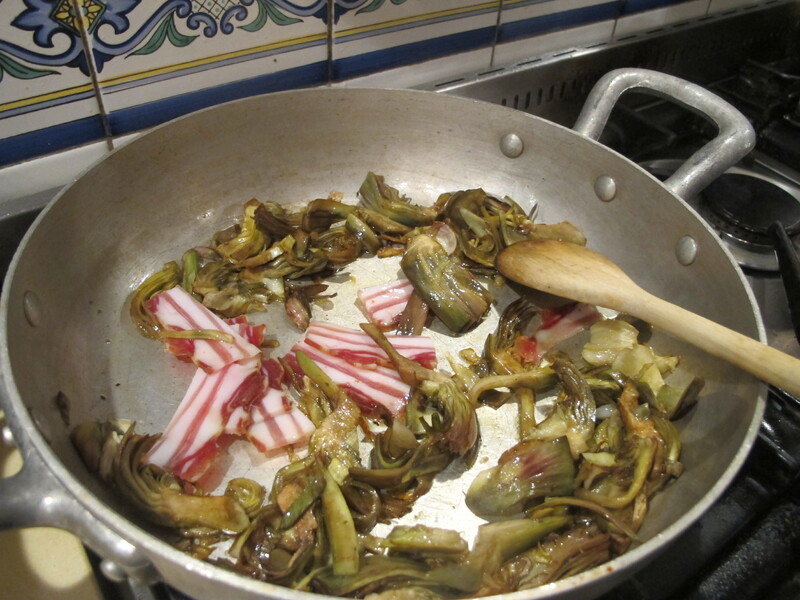 Keep cooking … the artichokes will need this liquid to become tender. The flame is quite high. Keep adding the pea soup, as required. When the artichokes are tender (push a fork through one of them to find out when) … it should take about 10 minutes or so from start to finish … Add the cooked peas. Turn the heat down now. Put the lettuce where the peas had been (please notice I used up all the pea soup) bar a tiny amount. Cover with a lid and cook for about 1 minute. Remove lid and add them to the big saucepan with the artichokes and peas. Remember these? Add the broadbeans to the big saucepan and use a wooden spoon to gently combine all the ingredients, cooking them for another couple of minutes. 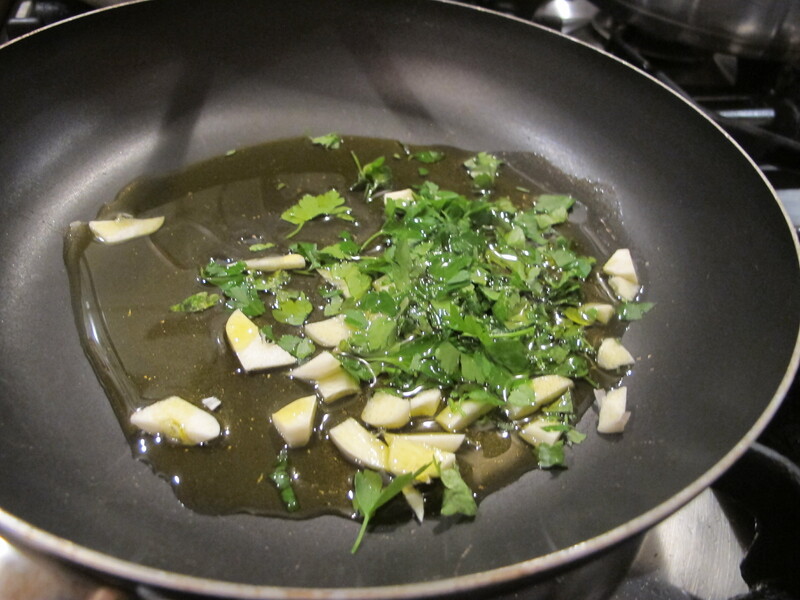 The two kinds of mint … Add the mint and then swirl some more olive oil over the vignarola. It is now ready to be served. The vignarola is best served at room temperature, not hot. The heat tarnishes the taste somewhat. As with many a stew, vignarola tastes even better the following day. And as you can see, a posh, indeed regal, vignarola … can never be ‘dry’. And don’t forget the bread … to mop up the sauce afterwards. The making of a vignarola is a kind of culinary pilgrimage, it must adhere to season and month when these vegetables pop up all together – April. And so one harkens to Chaucer and to his Canterbury Tales and to the ‘pull’ of pilgrimages that this month sparks off. What is tugging at your soul this Spring? Because … two pumi are better than one. 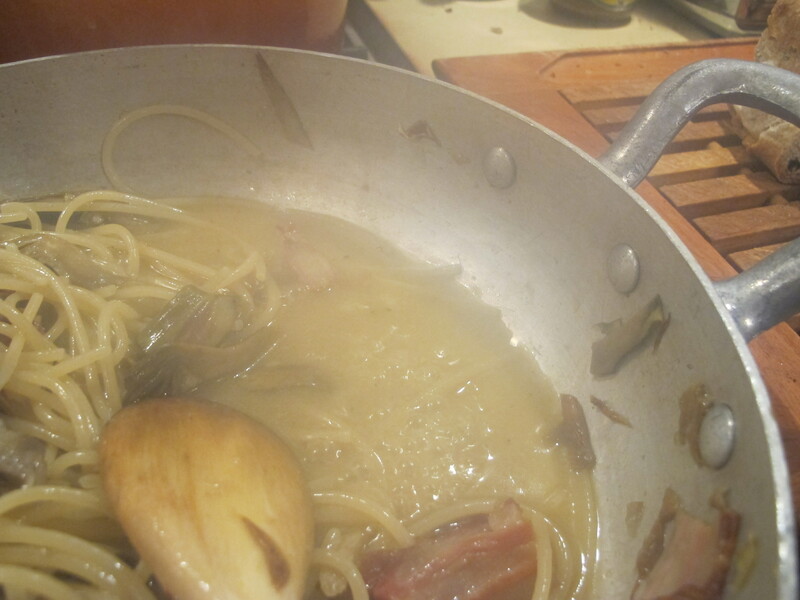 This being my very first post on my new blog, I thought it would be apt for me to write about a recipe that is truly my own, and the brainchild not, as can be my custom, of a thrifty use of leftovers but, instead, of a dedicated constellation of ingredients in honour of a great Italian pasta brand, Verrigni. My husband and I visited their offices in Abbruzzo at the end of last summer and came away with boxes of their pasta, as well as some Valentini olive oil that they were stocking and jars of their own tomato sauces for which they had received a special mention of excellency in the Gambero Rosso magazine. Now, while the pairing of fish and artichokes is playfully encouraged in modern Italian cuisine, and whilst the use of grated pecorino cheese is sagaciously tolerated in fish dishes such as pasta with mussels (pasta con le cozze e pecorino) or pasta with swordfish (pasta di pesce spada e pecorino), a further addition of pork fat by way of pancetta is rather pushing things a bit, believe me. Risqué even. True, a king prawn enveloped in a sliver of snow-white fat (lardo di Colonnata) and left to melt for a few minutes in the oven makes for a dainty dish on an antipasti or finger-food platter but – and this is the point I am making – we are speaking of only two ingredients: the prawns and the lardo. The gastronomic ford I was about to wade through with my recipe was not a shallow one. Fish and dairy? fish and meat? no, they do not usually meet and greet in the Italian kitchen. And, what’s more, I would be breaking the unspoken commandment that underpins this culinary tradition, and one I usually fully uphold, and that is the prescriptive ‘Thou Shalt Not Transubstantiate More than Six Types of Foods in Any Pasta Dish’ ! Ask any woeful Italian lamenting a disappointing pasta eaten abroad and the most common pitfall will be the mish-mash of far too many ingredients in the pasta dish. The six food categories I refer to are the following: 1. Vegetables (any amount – from garlic and onions to tomatoes and kale and herbs of course), 2. Fats (evoo, butter, or even lard) 3. Cheese (parmesan, pecorino, ricotta etc), 4. the Pasta itself, 5. Salt (salt is one of the most important ingredients and never to be overlooked) and Pepper or Peperoncino (chilli) and, last, 6. Meat OR Fish). I, instead, was going to include both meat AND fish. I knew I was crossing the line … such is the trepidation of a home cook embarking on an iconoclastic pasta journey. Hopeful as I am of raising a smile in the reader just as I myself smile as I write these words, I do have to come clean and say that I wasn’t being totally tongue-in-cheek about crossing the line. It is usually what experienced chefs do, and magisterially so since that is their profession. I already mentioned my doubts over fusion cooking and self-appointed ‘creative’ cooks in a post last year (https://myhomefoodthatsamore.wordpress.com/2014/12/30/roman-oxtail-and-cus-cus-fusion-confusion-and-creativity/) and have no problem reiterating this opinion here. One has to be a really experienced cook and know what one is doing in order to be properly ‘creative’ and produce something truly good. At the same time, if one enjoys cooking and wants to push boundaries … nothing is set in stone in one’s own kitchen, and trying out something new and going with a hunch can be very life-enhacing. Even catastrophes are to be welcomed because something is always learned thereby. What it all boils down to, I think, is respect. Respect for the ingredients, for the culinary tradition and for the cook himself or herself. That is the only bottom line that should not be crossed. 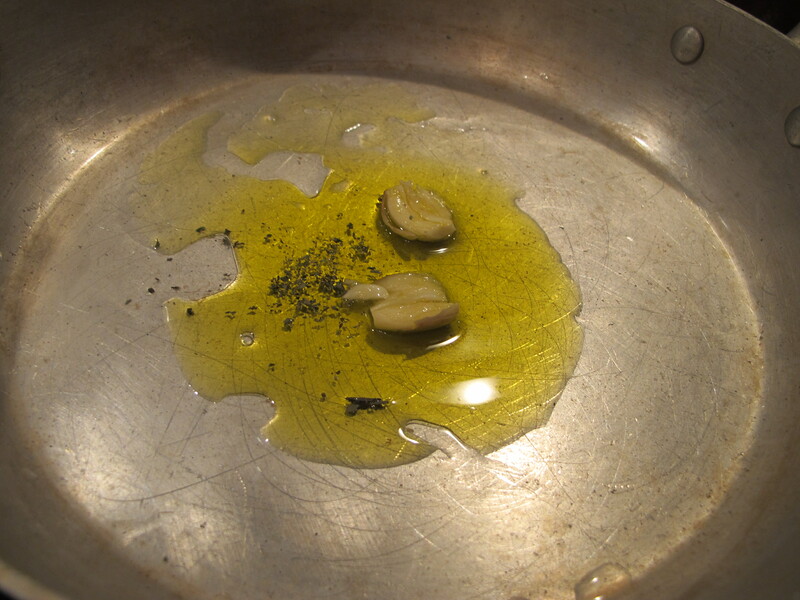 I bruised a couple of cloves of garlic and added them to a puddle of olive oil, sprinkling just a hint of dried mint. Mint and artichokes are traditionally a hefty part of the Spring dish ‘Vignarola’ … and I wanted to evoke the expectancy of longer, sunnier days of Spring in this dish. I then proceeded to cook artichokes in that saucepan, over a medium flame. The artichokes had been trimmed and sliced into quarters. 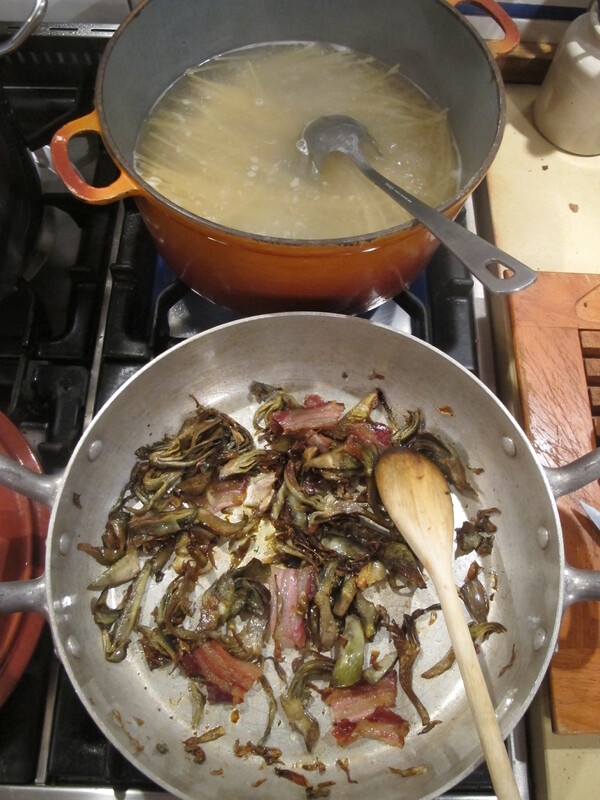 While the artichokes were cooking I sliced up some pancetta. 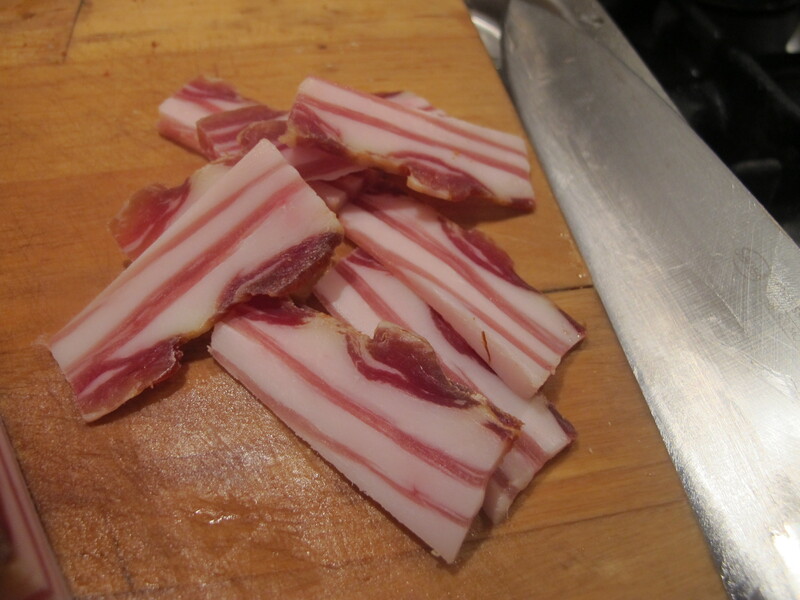 As you can see, I left the pancetta slices quite large … large enough for me to fish them out easily later on. 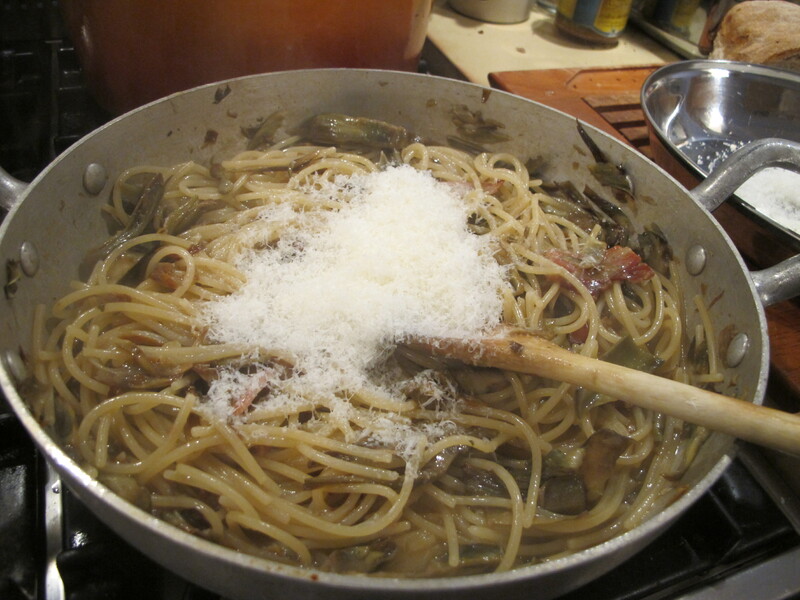 I grated some Pecorino Romano (Brunelli brand) and set it aside. 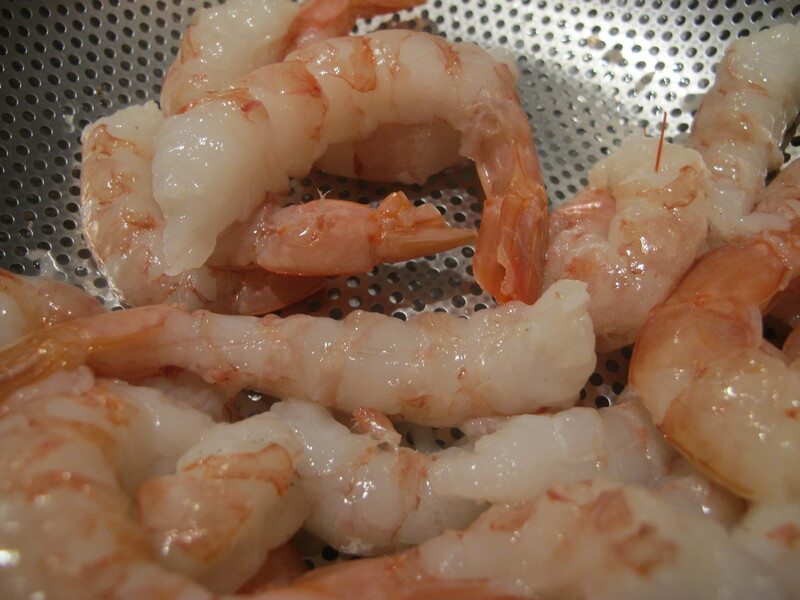 I peeled the prawns and removed the unsightly gut running through their backs. Newcomers to Italy are often surprised to learn that Italians tend to shun garlic in the kitchen, often removing it from a dish as soon as it has imparted its taste to whatever is sizzling in the pan. Also, the clove of garlic tends to be used whole or even unpeeled. I, instead, wanted a sharp dose of garlic taste in my dish and cut up the cloves of garlic to increase their donation. I also added about a tablespoon of fresh parsely. 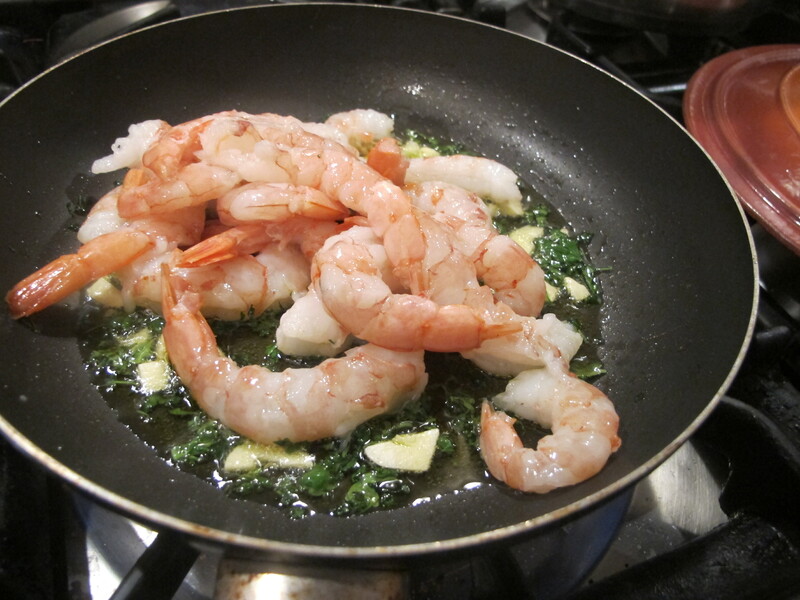 This is the old fashioned way of cooking prawns: olive oil, garlic and parsely. Please note, however, that at the appointed time, I would add only the cooked prawns to the pasta sauce, and leave the garlic behind. 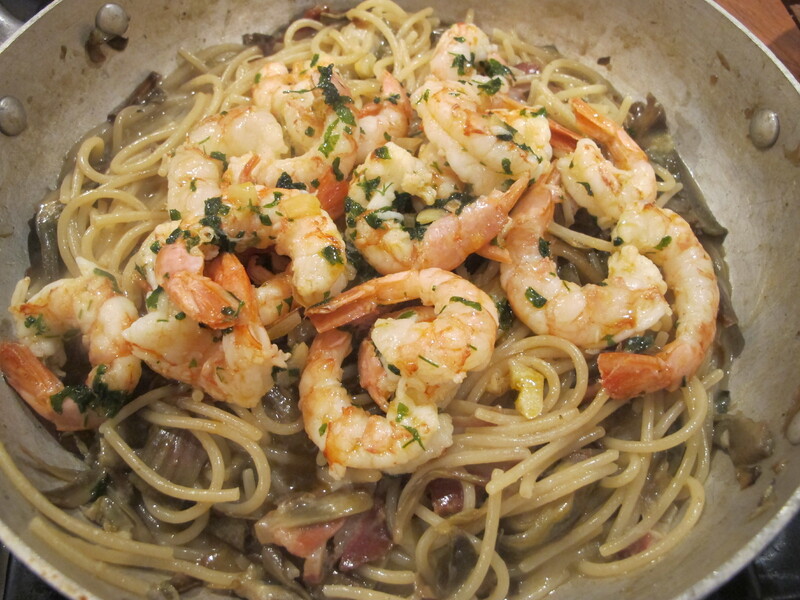 Please notice that I added the prawns even before the garlic had turned golden. I sprinkled some salt and tossed the prawns in the pan. I cooked the prawns for very little time … probably less three minutes … before removing from the heat and setting aside. 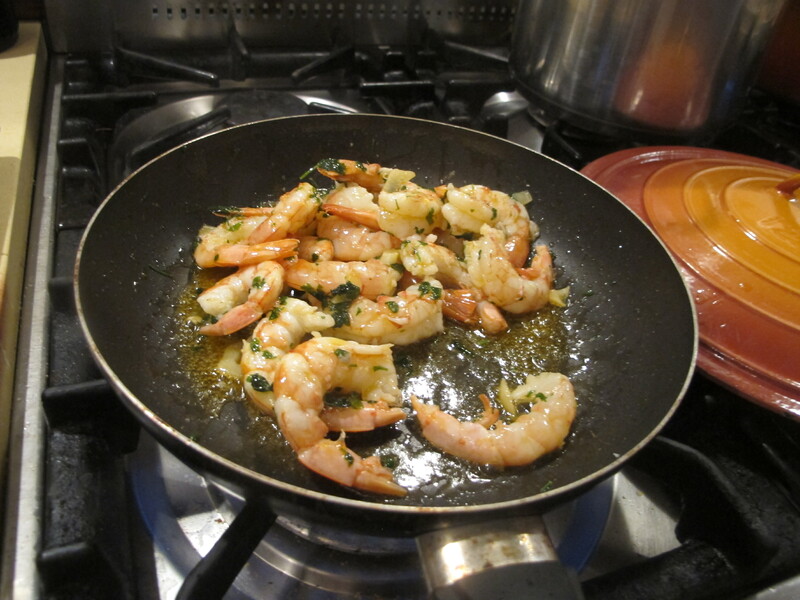 Overcooking prawns makes them go rubbery. The spaghetti were boiling away. The artichokes were cooked too. As were the slices of pancetta. 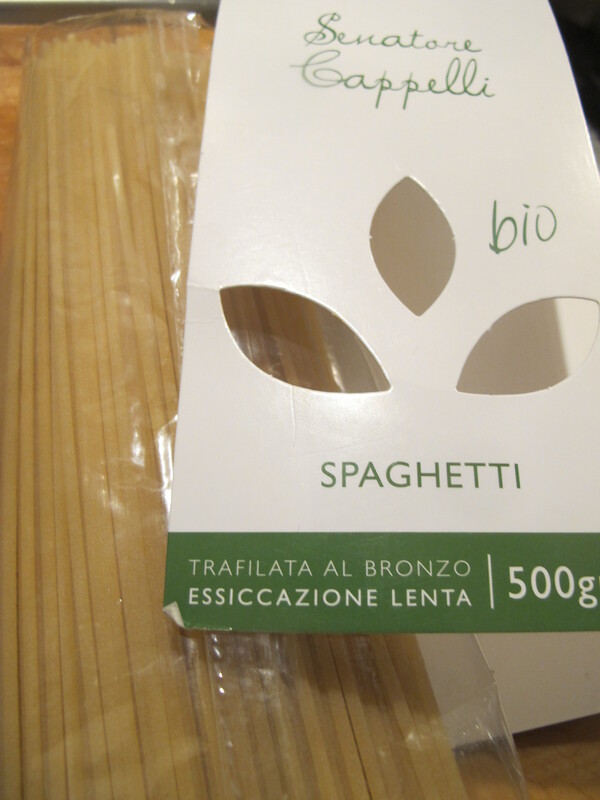 I cooked the spaghetti for half the time suggested on the packet. 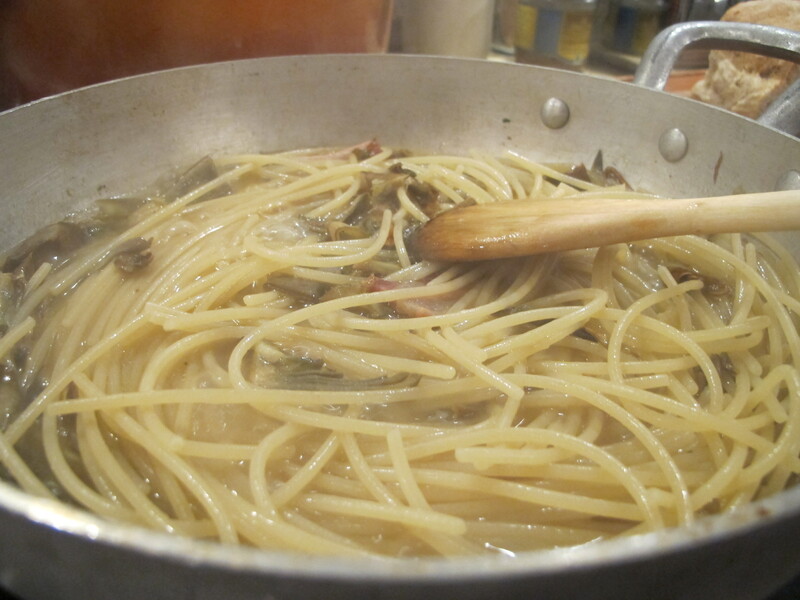 I put the spaghetti directly into the large saucepan with the artichokes. I added some cooking water and started stirring. I kept adding the cooking water, as much as was required, stirring all the while, until the spaghetti were done and a nice ‘creamy’ sauce was there to bathe them in. I now switched off the heat. 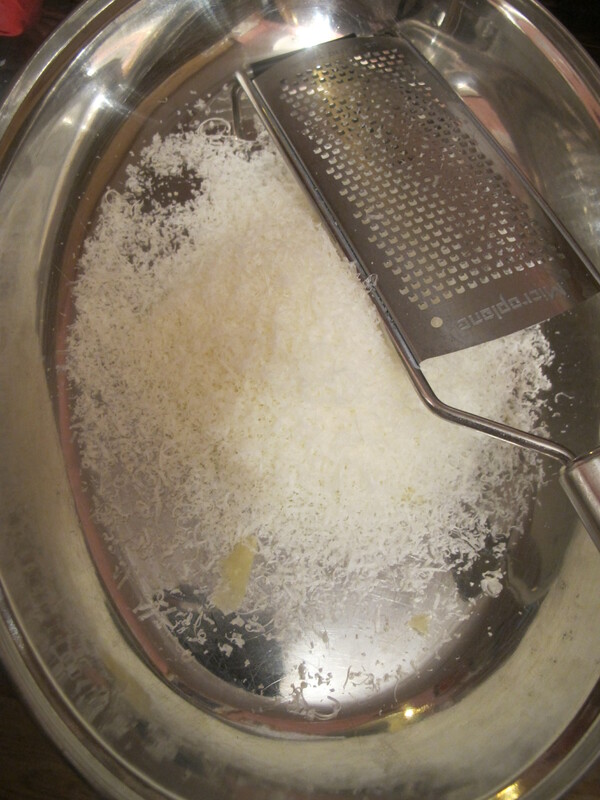 I added about half the pecorino cheese I had grated, and mixed it in. I wanted to add the cheese before the prawns, because otherwise they would have been bruised. It tasted good already … even without the prawns. 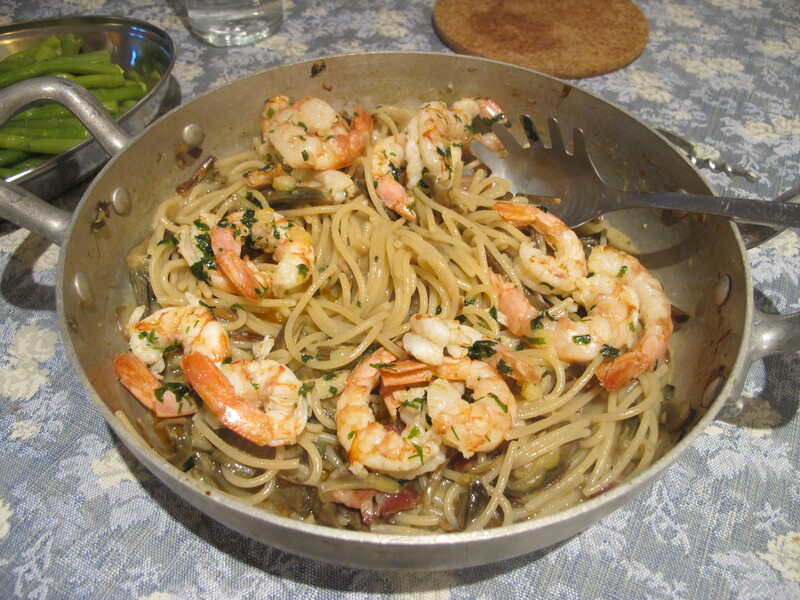 And voilà — the prawns reigning over the spaghetti with artichokes. 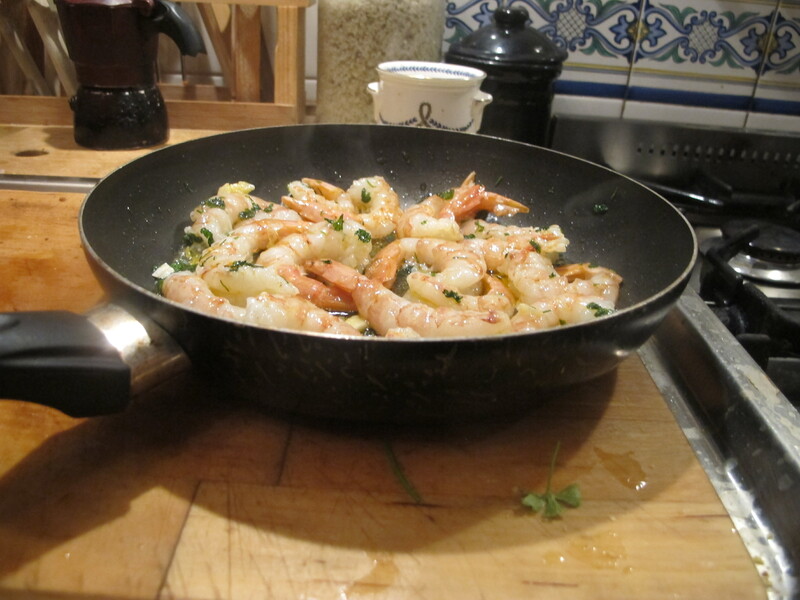 I used a pair of tongs to transfer the prawns from their saucepan to this one, thereby leaving the garlic behind. What I do remember is that I served the spaghetti in a ‘mound’, in the centre of a flat plate. I placed a few prawns on top of this mound, and sprinkled pecorino cheese around the mound. I did NOT include the pancetta … the pancetta was there only and primarily to impart a ‘richness’ in order to enhance the variety of tastes lingering on the palate. The actual eating of the pancetta with the spaghetti would have ruined this balance and the pancetta would have ‘dominated’ and completely taken over the less robust taste of the prawns. So, I suppose that in a sneaky sort of fashion … I did follow the rule of no more than six categories of foods, albeit in a now-you-see-it-now-you-don’t sort of way! And was this pasta recipe good, you might ask? Yes. Yes. Very immodestly yes.